← Is Your Adviser a Fiduciary? The S&P 500 Index delivered a 13.69% return in 2014 as the market continued to reach new highs after reaching new highs in 2013. 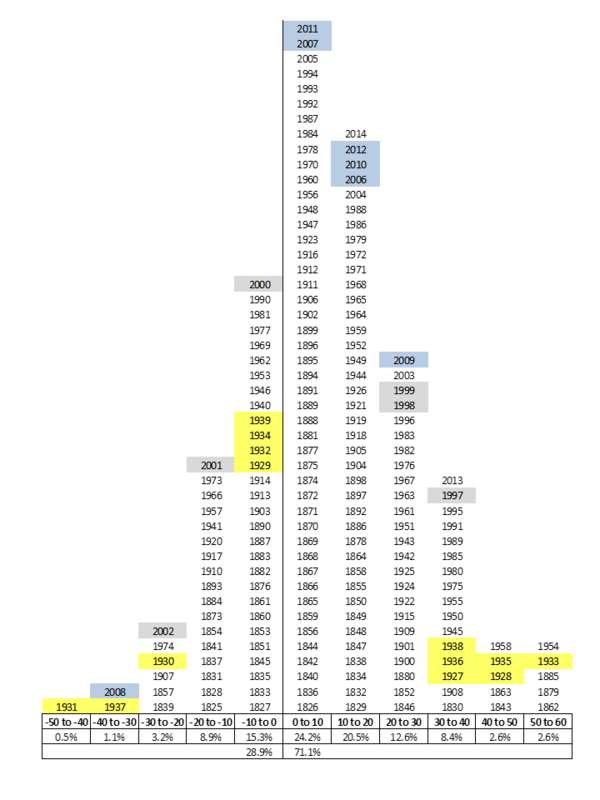 This year, for the first time, I have highlighted the years corresponding with the inflation and bursting of the DotCom bubble (grey) in addition to the Great Depression (yellow) and the Housing bubble (blue). Clearly, there were more extremes and more years of extreme results during the Great Depression than the two most recent crises. In eight of the years from 1928 through 1938, the market either lost or gained more than 30%. In contrast, in each of the DotCom and the Housing bubble periods, the market had just one year of such an extreme. In half of all years since 1825, the market delivered a return between -10% and +10%. So, if we narrow the definition of extreme to losses or gains of more than 10%, the Great Depression experienced nine such years, the DotCom bubble five, and the Housing bubble five. Many argue that the Federal Reserve is getting better at managing crises, and the above data would seem to agree. The Great Depression was the first crisis that the Fed experienced and many recent policy makers, including Ben Bernanke, went to school on Great Depression policy. On the other hand, others argue that the mere awareness of a Federal Reserve “put” is creating crises that future Fed policy will be unable to fix. I guess we will know who is right soon enough. The return mode is still 0% to 10%. In a large majority (71%) of years, the market is positive. And, the market experiences declines of 10% (20%) or more in a mere 13.7% (4.9%) of years. So, an outsider’s perspective indicates that investing in the broad market is clearly in your favor, in part because of natural inflationary increases, and in part because of real increases in productivity and earnings due to technological and human capital advances. The insider’s perspective is a different story. As of January 19, 2015, Shiller’s CAPE sits at 26.7, which is 61% above the average CAPE of 16.6 since January, 1881. The only periods in which the CAPE was higher than today were 1929 – 1930, immediately before the Great Depression; late 1996 – 2002, immediately before and after the DotCom bubble burst; and from late 2004 – late 2007, immediately before the bursting of the housing bubble. So, the CAPE is not a great short-term timing mechanism because recent extremes were able to persist for long periods, but it is an excellent indicator that the piper has to be paid eventually. Other market indicators including Tobin’s Q and Buffett’s PE confirm the implications of Shiller’s CAPE. Investors who were cautious in periods like this had dry powder to exploit market declines. Investors who chased returns in periods like this rode the market without a brake (a hedge) and often only got off the ride by jumping off at market lows. This entry was posted in Uncategorized and tagged Behavioral Finance, CAPE, Conventional Professional Investors, Historical Market Histogram, Housing Bust, Margin of Safety, Market Returns Histogram, Quantitative Easing, Risk, Robert Shiller, Tobin's Q Ratio. Bookmark the permalink.